Traveling through Europe is always an exciting experience, but it can be quite daunting for those who are traveling for the first time. Italy is a wonderful country with lots of culture and history; there’s plenty to see and do and backpacking is one of the best ways to do this with lots of adventures along the way. If you’re considering backpacking through Italy, it’s important to plan ahead so that you know what to expect. Conduct some research, learn how to stay safe, and focus on what you really want to see and do in order to make your backpacking trip through Italy one to remember. We are spoilt for choice in Italy as far as hiking locations go. There are miles and miles of trails and in some areas, you’d least expect. Here in Lombardy, the closest trails to Milan are just a short train ride away near Lake Como. The Larian Triangle is the mountainous area between the two branches of the lake, offering amazing panoramic views and trails for all levels of hikers. Another incredible hiking area is the Valtellina Valley, well-known for wine production. In Valtellina you can hike the pre-Alp trails through the terraced vineyards which are a UNESCO cultural heritage candidate. If you are really ambitious, you may want to check out the Via Francigena, an ancient pilgrimage trail from Canterbury to the Vatican that goes through the U.K. to France, Switzerland and throughout Italy. In Italy the Via Francigena goes through the Alps to the great plains to the Apennines in Tuscany and eventually arrives in Rome. Other popular hiking trails can be found in the Dolomite mountains known for its picturesque glacial lakes. 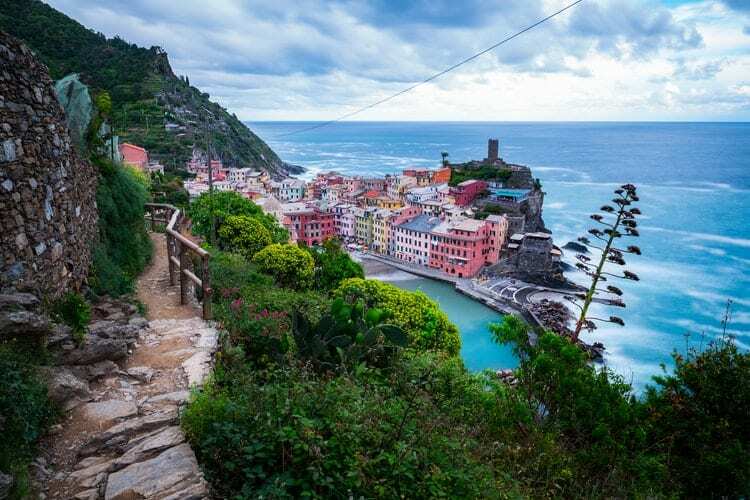 If you like the seaside, then the Cinque Terre in Liguria or the Sentiero degli Dei, or Path of the Gods on the Amalfi Coast are for you. If you’re hoping to travel through Italy on a budget, the good news is that this is entirely possible. Plans to save money should begin right from the very beginning. If you want to fly into Italy to start your trip, it’s a good idea to start planning well in advance, so that you’re in with a better chance of grabbing a good deal on plane tickets. Although hiking is best in Springtime, traveling to Italy is more expensive during the high-season from March to September. To save money, travel to Italy between early October and February. Traveling off-season also allows you to see the extraordinary landscapes and cities without the crowds. When looking for a flight don’t overlook the smaller low-cost airlines operating throughout Europe, you may find a deal by flying through smaller cities and airports. To save money, it’s a good idea to fly into a smaller airport, like Rome Ciampino or Milano/Bergamo-Orio Al Serio rather than a large city one such as Rome Leonardo Da Vinci or Milan Malpensa. Many travel booking sites will also allow you to sign up for email notifications so that you’re the first to know when the prices go down. And, plan your time of travel too – flights on a weekday are usually cheaper than those on a weekend. Train travel is very easy in Italy. The fast trains Freccia Rossa or Italo are excellent options for intercity travel. For example, from Milan to Rome, is now only 3 hours. By booking train tickets in advance you can save up to 50% than booking at the last minute. Once your travel itinerary is planned, it’s time to start preparing for your trip. Make sure that you have a good travel insurance policy, so you have peace of mind that you’re covered if you fall ill or sustain an injury. And, you’ll need a strong, sturdy backpack, especially if you are planning to live out of it for a while. Italy is home to many camping sites that are perfect for staying at throughout the summer if you want to explore more of the country. Check out the best backpacking sleeping bags for travelers who enjoy camping. Lastly, make sure that you are prepared for the weather when you arrive. If you’re planning your trip in the summer, Italy has a very warm climate, but during the colder months (January-February), you can expect more rain and even snow. Italy is a very popular destination for backpackers, so there are plenty of cheap or even free of charge accommodation options available for those who are looking to see as much of the country as possible on a budget. You will want to look for lodges and cabins, in Italian called Rifugio or Baita which are usually budget friendly. In the major cities, you will find a wide range of hostels and budget hotels that you can use as a base, or if you prefer to learn more about the culture and meet some of the friendly locals, you could try couch surfing or stay in an Airbnb. Try and find accommodation that is just outside of the major cities, but close to transportation options, as this usually works out cheaper. Italy has several amazing historical sites, cathedrals, museums, and much more for travelers to see and enjoy. However, at popular sites such as the Colosseum or Vatican Museum, for example, you’ll often find huge queues and you could be waiting for hours. So, it’s a good idea to buy your tickets in advance. You can find tickets from official tour operators online and it’s usually cheaper to pre-book through the website compared with paying at the box office on the day. A skip the queue ticket will give you more time to explore the attraction of your choice. Do you have any tips for travelers planning to backpack through Italy? We’d love to hear from you!